The term digital divide is defined as inequity between individuals with Internet access and digital literacy skills and those without access and those capabilities. It originated from a 1999 study conducted by researchers at the National Telecommunication and Information Agency. Almost 20 years later, one would think the issues of limited access and inequality with digital skills are not significant due to the popularity of Internet-based and mobile tools in the public and private sector. 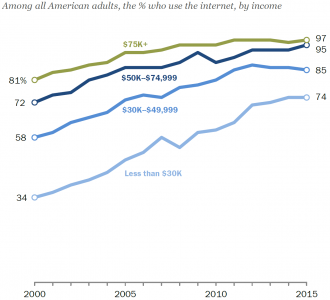 However, a 2015 study conducted by Andrew Perrin and Maeve Duggan, on behalf of Pew Research Center, indicates that although Internet access increased 32 percent among U.S. adults over a 15-year period, there are double-digit disparities within the following demographic categories: age, education, income level and ethnicity. The digital divide is an important U.S. public policy issue because the Internet is considered an important resource for advancing education, culture and economics. Internet-based goods and services are prevalent in public and private sector goods and service delivery. For example, these services range from food delivery to medical insurance. The Internet also facilitates innovative business models that aim to add convenience and new opportunities with less barriers to entry. However, since these models have been expanded since the 2000s, disparities still persist. On behalf of the Pew Research Center, Aaron Smith evaluated the digital economic trends in 2016. The business models studied included on-demand transportation services like Uber, crowdfunding services such as Kickstarter, and home-sharing services like Airbnb. According to Smith, Internet-based services are supposed to improve inconveniences in everyday life and provide flexible employment and income opportunities for individuals. However, based on feedback from 4,787 survey respondents and 8,314 panel participants, roughly half of the public has only modest exposure to the shared or on-demand economy. Also, 28 percent of Americans have not used any of these services, and 20 percent have used just one of them. 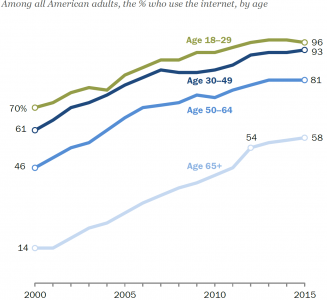 The demographic composition of users of the digital economy also follows a similar trend found in the Internet access study. The users of the digital economy tend to be more affluent, in possession of advanced degrees and younger. Human Capacity – the user’s level of understanding of Internet tools, resources and digital literacy skills (e.g., word processing, data analysis, social networking). The rate of innovation in the Information Age is rapid, so individuals that are slow to adopt new technologies also might experience frustration or anxiety when they finally access the Internet. Enabling Environment – community-based and personal environment in which users of Internet tools can be engaged and productive. It might be difficult to implement programs that can accommodate new Internet users from different demographics such as age, income, education and ethnicity. Thorough strategies require a significant amount of research, analysis and evaluation of identification of relevant use cases. Technical solutions need to ensure that software and hardware components are accessible and relevant to public needs. The users need to remain motivated to maintain their skills regarding its use. Policy developers and regulators also need to be informed about the how technology changes impact equitable access. These enablers will be reviewed to understand how public and private entities committed to reducing the digital divide consider the personal environment and dissimilar skill levels. Programs studies will range from government-sponsored, private initiatives or public/private collaborations. The potential impact of focusing on the human enablers in digital awareness and literacy programs have the potential to improve overall engagement, efficiency and democracy. Philanthropic organizations like Bloomberg Philanthropies fund innovation delivery teams that help mayors effectively design and implement solutions to pressing challenges in their cities. Where public resources are limited, the private sector can assist public entities and innovate their services and outreach capabilities. Community-based organizations in neighborhoods with underserved demographics (e.g., limited education, elderly, disabled, low income) that facilitate learning sessions with experienced technicians as evidenced in the Free Library of Philadelphia Hot Spots initiative. The learning environment is familiar to participants. Facilitators can leverage knowledge about barriers unique to that community which can be improved through the technology being offered. The 21st century Internet was the equivalent of the telephone or the television. Technology innovations will always occur, so proper support tools to help users in the transition is necessary, and manageable. I could not agree more with your attribution of the disparities of digital literacy across race, gender, education and economic lines to human capacity and enablement. I greatly appreciated that your article did not stop with the issues but raised viable solutions to minimize the gaps and candidly explored obstacles to the implementation of such solutions.